I know it's cliche to do a Thanksgiving post on a blog, but it's my blog and I'm a sentimental fellow so here goes! 2014 has been a tough year for me and my family...not tough in a bad way but in terms of a lot of change, some bad but mostly good. I'm definitely taking a little bit of extra time this Thanksgiving to reflect and be thankful for all of God's blessings on us. I've got a wonderful wife who has been with me every step of the way and who is the true backbone of our family, we've got four amazing children who bring us so much joy, we've got families that are loving and supportive, and we've got friends old and new who enrich our lives. I'm thankful to finally have a stable job, where I'm really happy and excited on what I'm working on, and I'm thankful to live in such a great country with all of its freedoms and rights. Finally, on a blog-related note, I'm thankful for all of the great opportunities that have opened up because of my writing on this sight, all of the great people I've met online through blogging and writing, and for all of my loyal readers who have made The Rock and Roll Chemist the popular and successful site it is today. So sit down today with family and friends, enjoy your meal, watch some football, relax, visit, and take a little time to reflect on the good things, the things you have to be thankful for in your life. It's too easy, especially in today's fast-paced world, to lose sight of what's really important and not count your blessings. Try to keep from falling into that trap and instead count your blessings...you'll be glad you did. As someone who has been obsessed with the Beatles for basically my entire life, I've stuffed every scrap of information about them that I possibly can into my head. The number of books, magazines, websites, movies, television shows, and interviews I've consumed has led to a vast knowledge of Beatles facts, ranging from the valuable to the obscure. As such, there's always the danger when I read a new book about them that it's going to fall short. There have been so many books written about them over the past fifty-plus years that it has become a full-time exercise in sorting the wheat from the chaff in order to find the worthwhile books. When I first heard of the new book, The Beatles Through Headphones, it seemed like an interesting take on the music that has been dissected and written about innumerable times. Whether or not this ends up being a worthwhile entry to the library of Beatles books will be the focus of this review. The concept is simple: the Beatles' music sounds better through headphones and has loads of sonic delights and nuances that are missed when listened to through conventional speakers. This is something every Beatles fans know, but there are still new things to discover with each listen (I say this as someone who still finds new things 30 years later). Author Ted Montgomery went through each and every Beatles song and documented any aural nuances. The book is laid out in a straightforward manner, running chronologically through the albums from the beginning of their career in 1962 through to the end in 1970. Both stereo and mono versions of the albums are looked at. However, what seemed like it would be a fun and perhaps enlightening read turned into something a lot more frustrating for me. -Numerous errors in personnel and attributions (for example, saying that George says "bye!" prior to "Sgt. Pepper's Lonely Hearts Club Band (reprise)" when it's John). As you can see, many of my criticisms are very nitpicky, which I readily admit. However, if one is going to claim to be an expert on the Beatles and write a book that wants to be included in the discussion along with more essential books like those by Mark Lewisohn, Ian MacDonald, and others, then these mistakes are inexcusable, not least because this is all readily available information that can be found on countless websites and books (many of which are cited by the author himself in his bibliography!). My final criticism has to do with the author's writing style, which grated after a while. Some of this was because of the use of descriptive words that didn't make sense or were too strong or weak for the message they were trying to convey. For example, calling a very simple part in a song "superlative" when describing something as minor as background percussion. This leads to a deeper irritation, which is that it seemed the author didn't quite know as much about music as he was trying to convey, and it showed. Maybe this is me being snobby (I did admit to this, remember?) but it got so irritating by the end of the book that I was thankful once I'd finished reading it. That's not to say that there was nothing enjoyable about the book. Many of the entries contained descriptions of some nuggets that I had forgotten about over the years and a few were new to me. Reading the book also did get me so excited to listen to the Beatles on headphones again that I couldn't help but do that in between reading sessions, which is perhaps its biggest contribution during the entire experience. 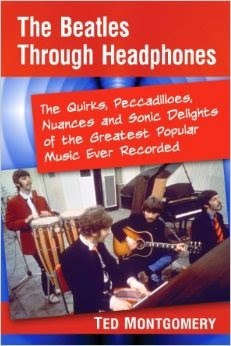 The Beatles Through Headphones isn't a bad book, and in spots it's quite enjoyable. I can see this being a really good book for the newer or more casual Beatles fan to use as a springboard to dive a little deeper beneath the surface of their recordings on the road to musical discovery. For more seasoned and/or obsessive Beatles fans, however, this is a quick read that probably won't offer anything new in the way of information and may frustrate you as much as it did me. All in all, this isn't an essential Beatles book for the serious fan but might be good for someone new to the band's music. This was in today's newspaper...I love it! There's always a great story behind the scenes when reading about any well-known rock band, and oftentimes the supporting characters are as interesting as the band members themselves. This can safely be assumed to be true given the sadly ridiculous and pathetic (in the literal sense of the word) story of Creedence Clearwater Revival. My review of Hank Bordowitz' excellent biography of the band, Bad Moon Rising, prompted a lot of discussion on message boards across the Internet as to the tragedy of the band's split and the never ending acrimony that persists to this very day. Clearly, there are a lot of interesting angles to the CCR story, so when I was approached by their former associate Jake Rohrer and his publishing company about reviewing his brand new memoir for my site, I jumped at the chance. Jake Rohrer acted as a manager for CCR during their all too brief career, having been friends with the "boys from El Cerrito" since first encountering them in high school. He was involved in their career from their beginnings as the Blue Velvets and the Golliwogs, all the way to the superstardom they achieved as CCR. He also worked for John Fogerty as his personal assistant for almost a decade after the band broke up before he was let go during John's long and frustrating period of writer's block and the endless lawsuits of the late 1970s. It was around this time that Jake got drawn in to the burgeoning drug trade, first buying and selling small amounts of cocaine before going into business with his brother and some associates and starting to make big money importing massive quantities of the drug and selling it for huge profits. He initially started doing this when he was hard up for money after the end of his time with John and the dissolution of his marriage. Not wanting to go back into the family automobile dealership business, he found this an easy way to earn a living, and while not a full blown addict, Jake did find himself using the drug more and more as he went along. However, eventually the Feds caught up to him and his associates, and his "boss," who had always preached a code of loyalty and silence, turned around and served up everyone in exchange for a lighter sentence. Pleading his case and pointing out that he was guilty of a lot less than some others were (including the fellow who ratted him out) proved fruitless and Jake found himself staring at a long prison sentence. However, rather than stew over it, he accepted the consequences of his actions and took his punishment like a man, so much so that he came to rather enjoy it (relatively speaking) and was able to get out after roughly half of his sentence was served for good behavior. Additionally, Rohrer had the clarity and strength to see his time in prison as a chance to clean up his life, physically and mentally, and he came out the other side with renewed purpose and as a changed man, finding the love of his life and inner peace and contentment. A Banquet of Consequences is the chronicle of Jake's entire life, starting from his near idyllic childhood in California through his time with CCR and John, leading up to his time in the drug trade and the years he spent in prison repairing his life. While he presents his story out of order, it never feels jumbled or as though you're jumping around reading it; in fact, the deviation from the typical linear flow that is usually used in memoirs is refreshing and works to great effect. Most chapters are a series of extended vignettes that illustrate the highs and lows of each part of the author's life. They're all enlightening and some of them are downright funny! He makes some excellent points, also touched on in Bordowitz' book, about how the eventual downfall of CCR was due to their attempt to become the next Beatles in the wake of the Fab Four's split in 1970. However, as Jake rightly points out, they didn't have the identifiable individual personalities that the Beatles did, nor the cross-cultural impact of the Beatles and they couldn't come close to approaching it. As for how he portrays his time in prison, it almost seems as though he had fun, and it's true that he did seem to have a fairly easy go of it, but he's quick to point out that he is emphasizing the good parts in order to balance the negative aspects that he lived through. Prison is never a good thing, but he is mature enough and reflective enough to recognize that it helped him straighten out his life and that he came out of the experience a better man. Creedence at their best, live in 1970. Turn it up loud! 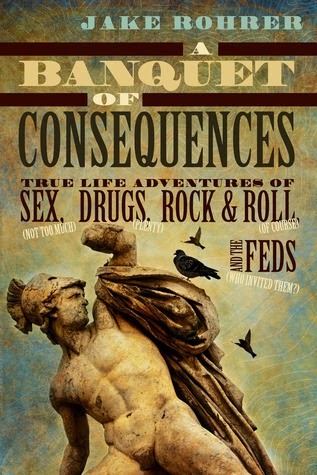 A Banquet of Consequences is a fascinating document of a fascinating life, offering eye-opening insight into the California drug trade of the 1970s and 1980s, as well as the machinations of the legal and penal systems. Jake Rohrer had experience with all of it from both the outside and the inside, and while he doesn't shirk responsibility for his illegal activities, he also does point out some serious flaws in the legal system and the law enforcement tasked with controlling the drug trade, all of which makes the reader stop and think. In addition, the fact that he was sent to prison for relatively minor offenses in the grand scheme of the drug trade, and all solely on the word of the man who was much more seriously involved in running it, is quite eye-opening. While there aren't too many new revelations on the CCR story for fans of the band, there are several humorous anecdotes about life on the road with the band, many of which come from when they were down to a trio in the wake of Tom Fogerty quitting, which is a era rarely covered in the band's history. However, his story and the experiences he had, both with and without CCR, make for fascinating reading and this book is well worth the time for any CCR or music fan. Sometimes, peripheral characters can have stories as interesting as the main players, and Jake Rohrer's memoir is a case in point. 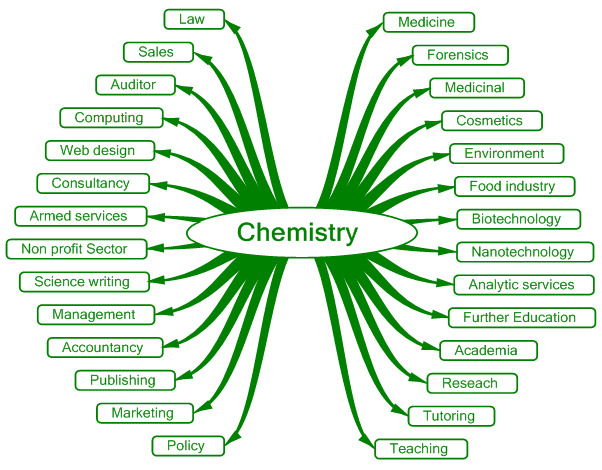 Now that I've been at my new job for a few months and am fairly settled in, I've been reflecting a lot on where I am and how I got here in terms of my career as a chemist. It's been a very strange, interesting, and (I think) unique journey, and one that's made me realize we can never predict where we'll end up or what we'll be doing. As I've written before on this site, I was educated and trained as a synthetic organic chemist, although unlike most who go into medicinal and pharmaceutical research, I did this as it applied to materials chemistry. I was a purely synthetic chemist but I also had a strong grounding and lots of experience in physical organic chemistry, which is the study of the properties of organic molecules. Looking back, I see that what I studied and how I learned it was really the precursor to today's dedicated materials science degrees, albeit with more of a pure chemistry bent (which makes sense since I was a chemistry major first and foremost, while the materials science degrees tend to have a broader scope and less specific/more general chemistry, physics, and engineering components all rolled into one). In any event, to make a long story short, I was a PhD organic chemist coming out of graduate school and the same when I finished my postdoc and started my first job in 2008. At my first company, I was working as a synthetic materials chemist in the area of nanotechnology, so I was still solidly in my comfort zone. When things really started changing for me was in 2011 when I took a new job at a new company that was completely out of my area of expertise or knowledge. For reasons I still fully don't understand, I decided to move to a company in the field of electroplating, an area I knew nothing about apart from a basic understanding of it. Looking back, I realize that by 2011 I had gotten a little bored working on the same class of molecules (fullerenes) since grad school; I was also really afraid of being pigeonholed as a chemist who could only work on these types of materials, which wouldn't bode well for any future career prospects in the event that I needed to find another job sometime down the road. Thus, I decided to take the plunge and take the chance to do something new and learn about a new area of science. The learning curve was quite steep at first but eventually I really picked up on it and enjoyed it. While I was no longer working as a synthetic chemist and was doing more engineering in my role, there was still a lot of chemistry involved and it really forced me to draw upon my broader knowledge of chemistry. In particular, I had to really dig deep and recall all of the inorganic, organometallic, and analytical chemistry I had learned years before, as well as some physical chemistry and physics. Beyond that, it opened me up to an entirely new field of science and technology that allowed me to use my chemical expertise in a more engineering and manufacturing-based R&D setting than I had been used to. All of which leads me to where I am now. As I wrote several weeks ago, my family and I recently relocated out of our native New England so that I could take a new job at a large company. This company is one of the biggest in the world when it comes to producing connectors, wires, and electronics technology. My work is in the area of advanced materials development, moving even further away from synthetic chemistry. I was hired for both my organic chemistry background and my experience in electroplating, product development, and process engineering. I've been here three months and am really enjoying it, as it's allowing me to use both my broader chemistry (mainly inorganic and organometallic) background as well as everything I've learned in electroplating and metallurgy over the last few years. Even though I don't do any organic synthesis, I find that I need to use my organic knowledge when it comes to the chemistry of our formulations and the various interactions between the different molecular compounds involved. What blows my mind when I step back and think about where I am is that I am now someone that people will come to for advice or help with electroplating problems. Three years ago I didn't know anything about electroplating other than the basics which I'd learned from a textbook; now, it's something I do and something that I understand quite well. Let me say that I certainly don't consider myself an expert...there are many people I've worked with both in the past and the present who have been in plating for decades and who have a wealth of knowledge that puts me to shame. But the fact that I am at the point where I have enough knowledge that it makes me helpful to someone else is quite humbling. What all of this has shown me is that, as I've written before, chemistry truly is the central science; a degree and a strong background in chemistry can indeed lead you in any direction. Furthermore, you never know where your career will take you, and the important thing is to make sure you never stop learning and never stop enjoying what you're doing. Ever since I started working in the plating and engineering side of the industry, and especially since I've started this new job a few months ago, I find that I learn a ridiculous number of new things every day. Sometimes it gets a little bit overwhelming but there's no such thing as too much knowledge and I know that in the long run, it will only help both broaden and deepen my experience and knowledge base. The main thing it has made me feel os that I'm no longer purely an organic chemist, and I don't consider myself one anymore. I feel as though I am now simply a chemist, with no qualifier in front of that word. The different types of chemistry I now work with and the breadth of science and engineering I am learning and applying on a daily basis defines me as someone who is no longer pigeonholed into one specific area of the field. It's been a long, strange trip so far, one I never would have conceived of had you asked me about it a few years ago, but I wouldn't have it any other way.